Who's ready for Christmas?? Some years, waiting for it to get here can be hard, but there are many ways to get into the festive spirit until it arrives. Dressing up in our exclusive Christmas Girl Costume will show everyone in the village that you can't wait for the holidays! Care must be taken when dressing in Christmas attire when it's not the holiday season. Some might see your cheerfully designed outfits, and think they have unwittingly jumped forward a few months into the middle of X-mas time, while other, more grouchy types might see your yuletide expressions and become even grouchier, especially if they have a smaller than average heart. But you can't let a few grumps rain (or snow) on your parade when you're in the mood for merriment! 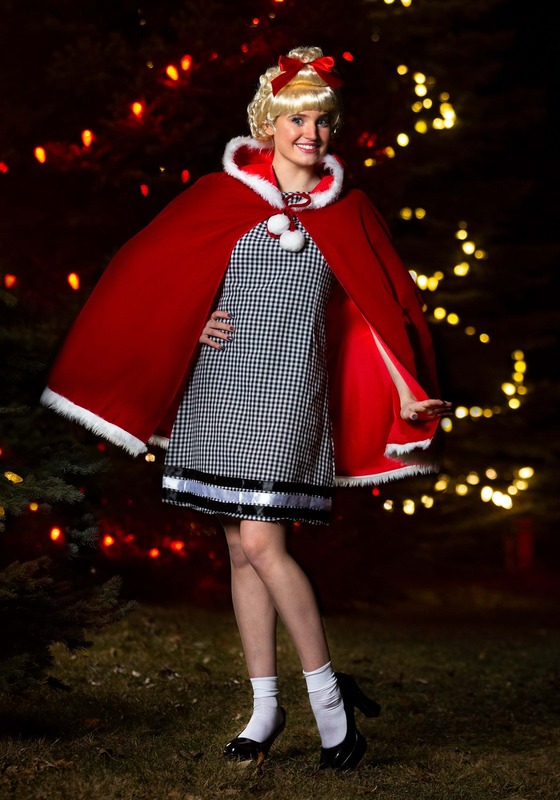 We know when you're in this festive dress and cozy looking cape, you'll be able to make even the meanest grouch's heart grow when you show them the true meaning of Christmas. We designed this costume to capture the warm, friendly style of the holidays. The black and white gingham patterned dress is a sweet, simple look that will compliment many festive accessories you may want to add, like socks and a cute pair of Mary Jane style shoes. The velvet and faux fur lined cape and hood adds some joyful color to the outfit, and looks like it could keep you toasty during a snowy night of cheerful caroling. 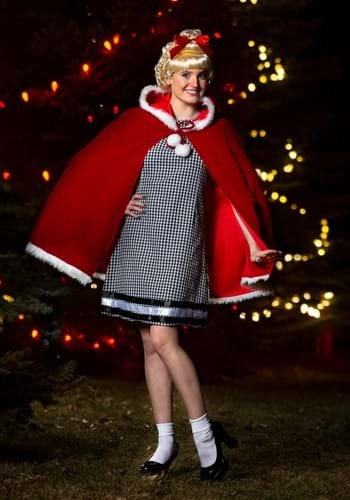 Put your own unique spin on this costume for your celebrations, or check out our accompanying wig to complete the Christmas Girl ensemble. Christmas will be here before you know it!